The topic of Charaben and Kawaii should be familiar to foodies for Japanese cuisine. So what happens when your pantry doesn't have any particular ingredients or utensils for creating these cute lunch boxes? Improvising, creativity and attempting should be the next step then. La Carmina is a well known Canadian blogger, Coolhunter, CNN TV Host, and Journalist who provides a book that should be a clear solution for those with a non Asian pantry in Cute Yummy Time. Her website is at lacarmina.com. 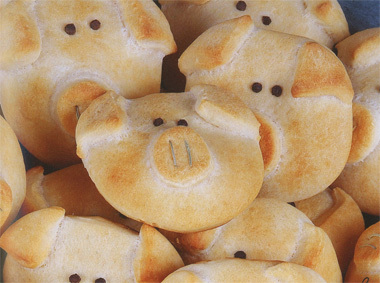 This is a step by step recipe cookbook, for anyone interested in making cute food, and then eating it. Many of these recipes are appropriate for a non-Japanese family to serve as food/treats for young kids, or between friends who want to exchange cute foods. La Carmina mentions a lot of helpful suggestions as to how to shape food, common ingredients or utensils that can be found. Ingredients don't need to be specifically from Asian cuisine, and tools are easily found online, or you can improvise, though the most important tool to have other than ingredients are the cookie cutters, parchment paper, tweezers, and toothpicks. Though for novelty, and wanting to tackle the sushi section, then a sushi mat is needed. 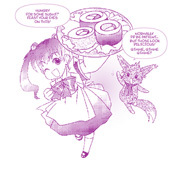 If you get bored, alongside the recipes there is also a running story of the author with her cat, on an imaginary adventure to Kawaii Land, featuring characters from her recipes. How adorable! Recipes are arranged by occasions, location, and meal type. So if you already know how these recipes taste like, want to spruce it into a cute food dish to serve next time? In American culture, edible food art has became a phenomenon that is pleasing for the eyes so while some people may feel some sadness about cutting, spooning or forking into these beautiful looking tasty morsels. In Japanese cultures there are reasons why parents of family members would want to make Charabens. This is either for child's social popularity, for the child's appetite, or a way to know what the child is putting in their mouth. Ask a typical Japanese child at lunch time and see if they have the same feelings about gobbling up a Charaben. I have mentioned Charabens twice, so what are they? 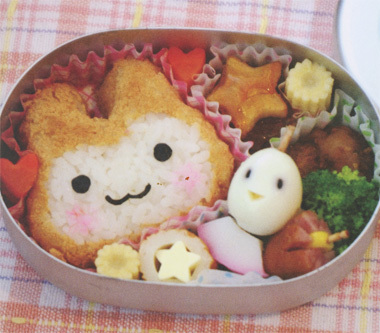 Charabens are simply character theme bentos, and to explain what bentos are - it is a meal in a box. The Japanese love to shorten words to emphasize the kawaii or cuteness effect. As a graphic artist, Christopher Salyers has taken Face Food and revealed to a western audience the talent that Japanese moms, dads or enthusiasts would prepare hours before, for just the happiness of their family members. There are magazines and books in Japanese and starting to be published in English that definitely encourages parents/craftsmen/cooks to try creating art in food. In this short, gift book size book, you can "ooh and ahh" over the bento examples, and then read a short question and answer paragraph, which is similar to being an artist statement, with the ingredients listed, seemingly like the medium of an artwork. Unfortunately this is not a typical cookbook. There are no step by step recipes, outside of two pages of Charaben brief explanation toward the end of the book that can be the start of a challenge for people who have already made their own charabens before. Yet if you want to get the actual step by step recipes, please purchase Salyers's follow up book, Face Food Recipe. Below: A photograph from Facefood. Food seems to be a big deal in Japanese culture, as eating is a big part of anime, manga, and live action shows, there are groups who sing about food, and a Yakisoba tent seems as ubiquitous as a bus stop. But what is it exactly that the characters are eating? The Manga Cookbook is your guide to discovering Japanese dishes, helping to identify many of the common foods you'll see in every anime and manga, and providing illustrated step-by-step instructions to prepare simple Japanese meals using ingredients you'll be able to find in your local supermarket. Learn to identify and make the same things you see in all your favorite manga: authentic onigiri (rice balls), yakitori (skewered chicken), oshinko (pickled vegetables), udon (Japanese noodles), okonomiyaki (Japanese-style pizza) and many others! And for those of you are complete newbies, it even covers how to use chopsticks. Features original manga illustrations by Chihiro Hattori. Soon, you too can enjoy a meal fit for an anime character! Oshii! You should consider Harumi Kurihara to be the "Martha Stewart" of Japan. She's more than a cooking guru, she's a lifestyle expert, with ideas about everything to make your home and life more fulfilling. The comparison is strengthened by her numerous bestselling cookbooks, her lifestyle magazine and line of kitchenware. Harumi Kurihara has won over the hearts of Japanese home cooks with her simple, delicious recipes and now this charismatic former housewife (and successful businesswoman) shares her award-winning kitchen secrets with Americans for the first time. Japanese food is famous for being great to look at and great for your body. But it is not easy to make using traditional methods. Harumi's book solves that problem. She makes it easy to create both the traditional family meals and some unusual concoctions of her own. Throughout, the emphasis on eating mindfully, varying ingredients and keeping portions small (especially for dessert) means that this is a healthful cookbook that doesn't try too hard to be one. These elegant, effortless recipes reflect Harumi's down-to-earth approach to Japanese cooking. Simply written and featuring everyday ingredients, recipes include Pan-Fried Noodles with Pork and Bok Choy, Warm Eggplant Salad, Japanese Pepper Steak, Seafood Miso Soup, and Harumi's popular Carrot and Tuna Salad, along with a chapter on simple ways to make delectable sushi at home. Mmmmm. I'm feeling hungry already!!! Even if your skills are limited to Macaroni and Cheese, this book will make you feel like a Nobu-worthy chef, and those who sample your wares will appreciate all the hard work. But it wasn't hard work at all — and you should keep that secret to yourself! Oh man, are these things addictive. There should be laws against this stuff. These are dried green peas covered with wasabi (a green, spicy horseradish paste that usually goes good with sushi), and while that might sound gross (to the uninitiated), believe us, it's really amazing. Now admittedly, this isn't for everyone. You've got to enjoy the feeling of your mouth burning with flavor, you've got to love spicy food. But wow, if this isn't the greatest snack ever invented, well then we don't know what is. Drink lots of water with these guys and then when you're addicted, upgrade to the BIG BAG! Pocky isn't just a snack-food, it's a full-blown addiction. Those who know us, know there's no stopping eating these darn things. They are delicious, crumb-free and very handy, since no chocolate winds up on your fingers. It's the perfect food while watching anime, or just watching TV or surfing the web. Simply stated, Pocky is a stick-shaped biscuit/cookie covered in a chocolate or flavored coating. You'll need to order them by the dozen, as the box disappears before you realise you've eaten so many. When you start getting the shakes from Pocky withdrawal, that's when you realize you're going to have to support this habit. Pocky is one of mankind's greatest inventions — that's how much we love this stuff. While many anime fans are eager to try and be the Iron Chef at home, the thought of navigating through an Asian grocery store is a different story. This highly illustrated book takes you by the hand and gives a clear and fascinating tour of these markets. The author starts the book by describing the layout of an Asian grocery store in her neighborhood. She shows that there is indeed an order to these markets. "Asian markets are generally stocked according to the principles of balance, " she writes. "Hot, spicy, chili sauces and curry pastes are all in one place; salty items are together in one row, and bitter, sour or sweet things are in other sections." The authors not only sort out the cultural context of an Asian grocery store, but also does it in such a way that makes you hungry to return. Besides there is nothing better than watching anime while eating a bowl of hot noodles!